We all headed south. It meant a very early rise, but it was clear that all were of one mind that this cause was something worth getting up early for. 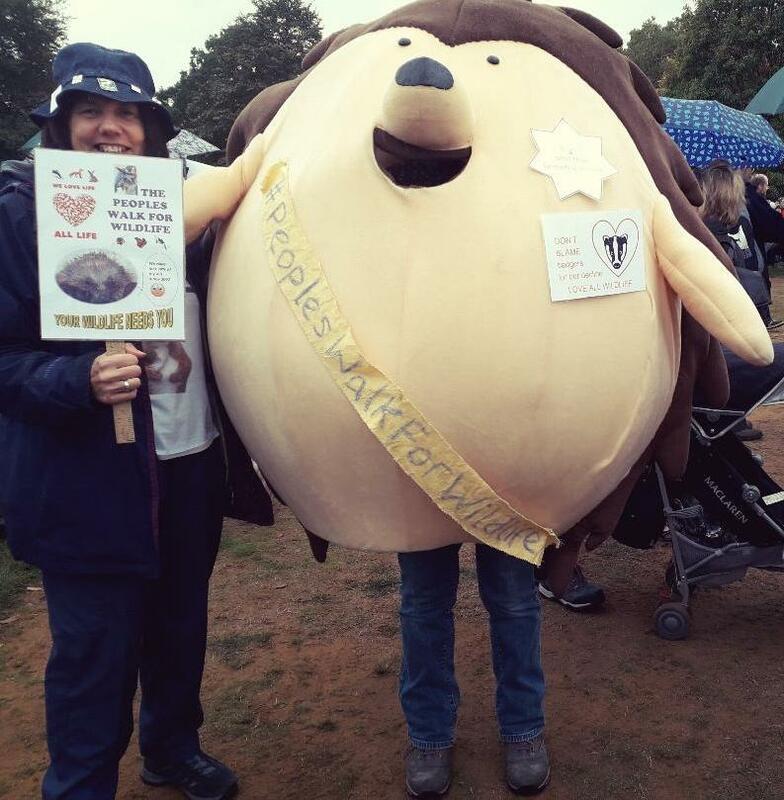 Several of the Friends of Pickering’s Pasture were going to Hyde Park to join others passionate about the natural world to march through London on The Peoples’ March for Wildlife. The gathering at Hyde Park had a slow start initially, but numbers soon swelled. One group had left Scotland at 02:30 while others had travelled widely from across the UK. We caught sight of key UK naturalists including Mike Dilger, Martin Hughes-Games, Bill Oddie, and Iolo Williams. The organiser, Chris Packham, had worked tirelessly for months supported by folk who have become known as his Ministers. For two hours we listened to interviews with children, experts, keen supporters until at midday the more formal presentations began. We heard passionate – and at times moving – talks from mainly young people. Georgia Locock, Bella Lack, Mya-Rose Craig and Dara McAnulty spoke of their fears for the future: fears of species extinction, habitat loss, climate change and our estrangement from the natural world. Adult experts provided numbers to endorse our concerns for the future: Dominic Dyer called for a halt to the badger cull and a stop to the slaughter of Scotland’s mountain hares; Professor Dave Goulson cautioned about the impact of agrochemicals on the natural environment; while Dr Ruth Tingay spoke of the challenges of wildlife crime. We were uplifted by musical contributions from Billy Bragg, Saskia Eng and Grace Petrie. At 1pm the move towards Downing Street began. The slow progress was witness to the fact that 10,000 people had gathered to express their common goal that we should invest in wildlife. Many had downloaded a file of birdsong so Piccadilly, Pall Mall, Trafalgar Square and Whitehall echoed to the calls of Blackbird, Blackcap, Chiff-chaff, Nightingale, Robin, Song Thrush and Skylark. This was to remind people that 44 million birds have disappeared from the UK countryside since 1966. Passers-by paused to look at placards, to chat to people, to join in or to peep their car horns. No-one could have ignored this collective of wildlife campaigners snaking through the City of London. Once the head of the march reached Downing Street, Chris Packham and some of his young campaigners presented a copy of A Peoples’ Manifesto for Wildlifeto the Prime Minister’s Office. This excellent and challenging document contains 200 proposals to end the war on wildlife. 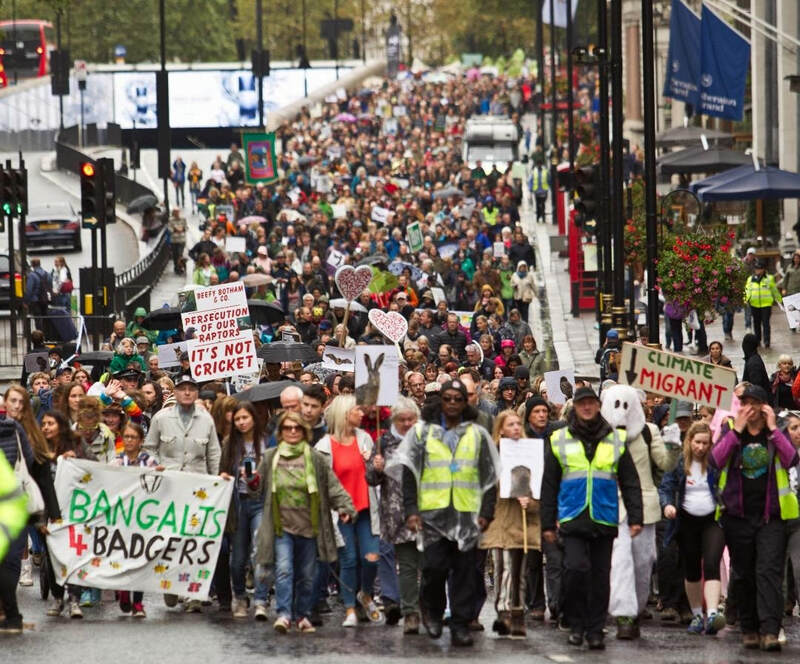 The march ended with more uplifting talks from George Monbiot, Mark Avery and Chris Packham. For two hours the rain had poured incessantly, but this did nothing to dampen the spirits and resolve of those involved. The march over, people then headed for the Underground and for the long journeys home. Most were exhilarated feeling that, for once, it was good to be shouting out for wildlife. Now the work begins. This must not be a one off. I am sure that those of the Friends who were there will be sharing their thoughts to the rest of the group. Always active to ensure that Pickering’s Pasture provides a haven for wildlife, the work will continue.